If you love cats, you might not like this story much. In fact, if you love animals you might have a problem with it. But if you can get past that, I think you’ll find a pretty darn good story. Here are the basics: A boy, Augie, lives on a farm with his parents. Except his mother lives in the old house—the one she was raised in on the farm—and the father lives in the new house with Augie and, sometimes, Lisa, the young woman who works on the farm and is, apparently, sleeping with Augie’s father. Also living on this farm are a gazillion cats, and Augie’s father assigns him the job of killing all the cats, with a $1 bounty per tail. The boy doesn’t have anything against cats, but he has fond memories of his dog—a recently deceased mutt who was exactly his age, having been given as a puppy to Augie when he was born. The mother, apart from her estrangement from the father, is a bit strange. She chain smokes Tiparillos and she has decided that she no longer needs to eat. She’s become a inedite, or a breatharian, someone who consumes only air. She’s also not much troubled by Augie’s cat-killing chore. If the story were only about killing the cats, the cruelty would be a problem, but of course it’s about much more than that. As Wink himself says in the Q&A with Callan Wink, the story is really about the boy being pulled in different directions by his parents, and also the other characters being pulled in different directions, too. Wink had a previous story in The New Yorker, “Dog Run Moon,” that is pretty memorable. I discussed it here. It’s hard to get past the animal cruelty in this story, but I really enjoyed it. Okay, I get that some people might be offended by this story’s portrayal of the cat killing, but I think those people have never experienced life on a farm, or perhaps they’ve never even read about life on a farm. The incident in the story is merely an extreme example of something that is probably still pretty common. But sending me an anonymous email attacking me because I thought, animal cruelty aside, it was a good story? That’s both idiotic and cowardly. You have to ignore the zealots. I enjoyed the story also, and I Live on a farm and the story was not only superb but accurate. I would tell the Animal Activist zealots to move on and get a hobby. They have way to much time on their hands. 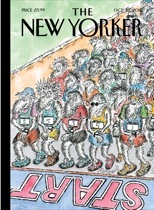 I subscribe/have that issue of the New Yorker but hadn’t read the story yet. This post compelled me to. You made the right call, Cliff. Geeeez, when animal rights activists act like psycopaths it really hurts their cause. It lends support to the politically incorrect P.E.T.A. (People Eating Tasty Animals). You are so right Caleb! “Breatharians” will be appearing in The Best American Short Stories of 2013 coming out in October. I guess the editors at Houghton Mifflin thought it was a good story too! Thanks for letting me know! Good news. Callan Wink is a promising new writer. And my goodness, he is quite handsome. He reminds me of the modern day of Hunter S. Thompson. It is sad he had to kill cats in the story but at least it’s not like a movie where cats actually get killed. I’m very excited to read more of Callan Wink’s new work. Um, movies are also fiction; people (and cats) don’t actually get killed. Those of you who have read Callan’s work, would you rather see a book of his short stories published first or a novel?